An insightful exhibition featuring the journeys of faith that Hajj pilgrims take in both body and in spirit, ‘Undangan ke Baitullah: Pilgrims Stories from the Malay World to Makkah’, was launched together with the Malay Culture Fest 2018 yesterday (12 Oct 2018). A performance at the opening, reenacting a pilgrim’s journey of faith. 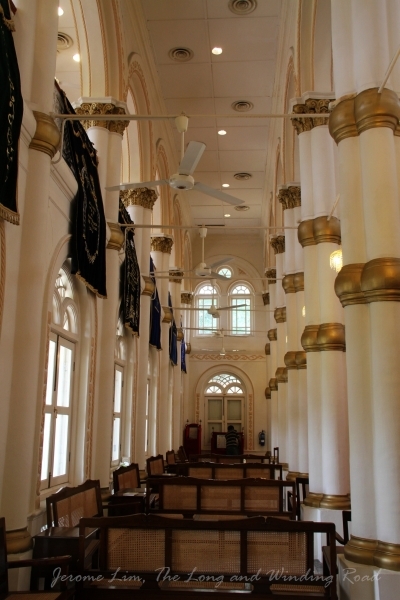 The exhibition, which runs from 13 October 2018 to 23 June 2019, takes a look at Kampong Gelam’s role in supporting the Hajj. The district, having been an important port town, saw Muslims from across the Nusantara congregate in preparation for the often difficult passage by sea to Mecca in days before air travel (the area around Busorrah Street was also known as ‘Kampong Kaji‘ – ‘kaji’ was apparently the Javanese pronunciation of ‘haji‘). Mdm Halimah Yacob, President of the Republic of Singapore, launching the exhibition and the Malay Culture Fest. Many businesses such the popular nasi padang outlet Hjh. 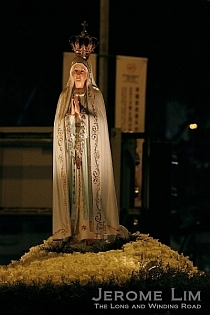 Maimunah had its roots in the pilgrimage. The restaurant, which has an outlet at Jalan Pisang, is named after the founder’s mother Hajjah Maimunah, who was Singapore’s first female Hajj broker (or sheikh haji). The enterprising Hajjah Maimunah also ran a food business during the Hajj catering to pilgrims from this part of the world in Mecca. The Malay Culture Fest, which was opened together with the exhibition, runs from 12 to 28 October 2018 and will feature lectures and performances over the three weeks. 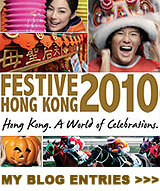 More information can be found at : https://peatix.com/group/40767/events. Entrance to one of the exhibition’s galleries. The hajj passport of a child pilgrim on display at the exhibition. A trunk and a suitcase used by pilgrims on display. 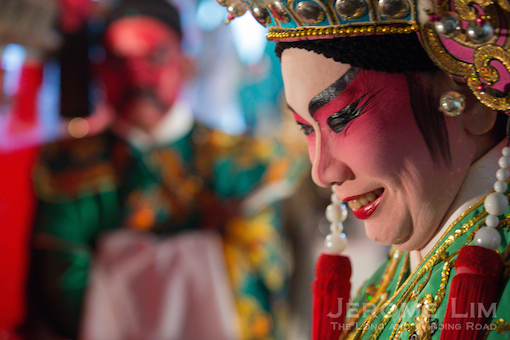 The southern isles of Singapore are steeped in myths, legends and traditions. 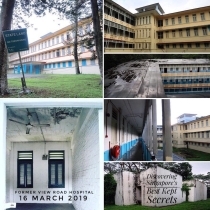 While most seem to lie buried in the sands that have expanded them, one that lives on is the pilgrimage to Pulau Tembakul – Kusu Island – that some accounts have as going back over two centuries to 1813. 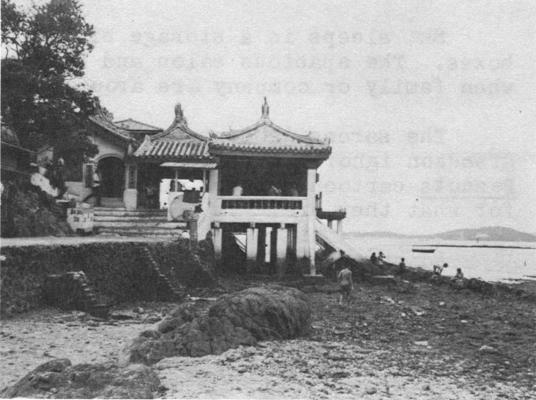 Kusu during a pilgrimage season of the past – crossing the causeway at low tide. (photo: National Museum of Singapore on Facebook). 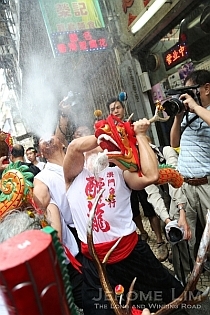 The annual event draws a steady stream of Taoist devotees. 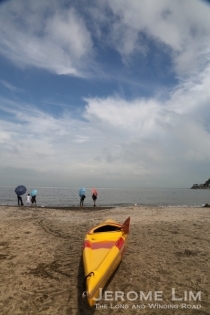 Although the numbers may have fallen from the highs of the 1960s and 1970s, thousands still make the short passage by sea every ninth month of the Chinese lunar calendar (which began on 9 October this year) to seek favour and blessings at the island’s holy sites. The sites are a temple dedicated to the popular Taoist deity Tua Pek Kong, and three keramat-keramat, which in this case are the supposed graves of (Muslim) holy persons who are venerated. This practice has its roots in Sufism and is discouraged by mainstream Islam and has over the years found a following amongst the Chinese. 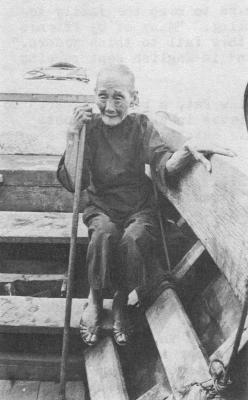 A devotee making her way to Kusu in 1971 (source: The Aged In Singapore: Veneration Collides With The 20th Century, Nada Skerly Arnold, 1971). Two of the island’s three keramat-keramat (found at the top of 152 steps). 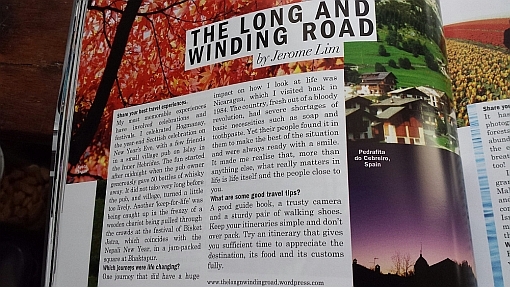 Perhaps the most popular of the island’s legends is one tied very much to the name Kusu. 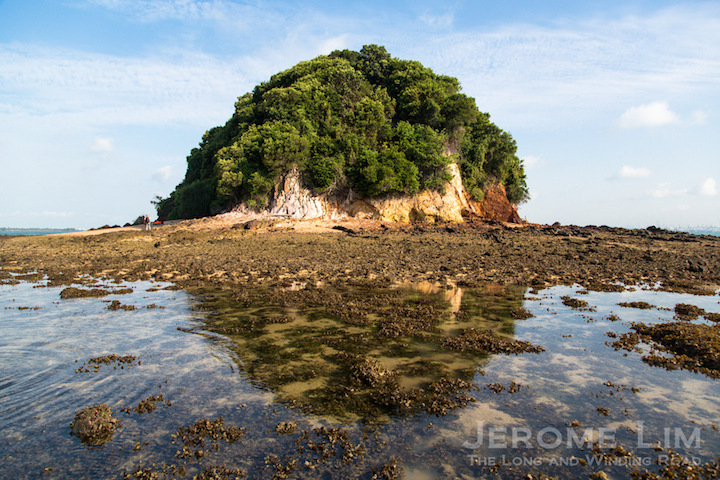 The island, which in its pre-reclamation days actually resembled a tortoise at high tide; its head, the outcrop on which the temple was built, and its body, the mound to which the head was linked by a natural causeway at low tide at the top of which the keramat-keramat are found. 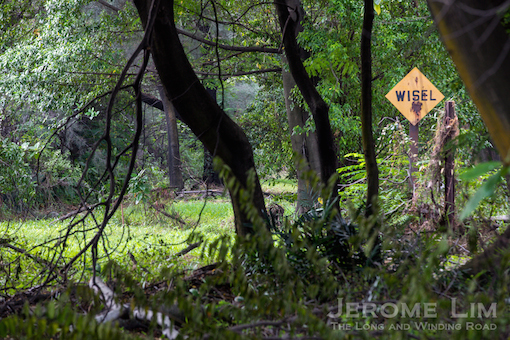 This legend, which also provides a basis for the pilgrimage, has it that a tortoise (or more correctly a turtle) had rescued two fishermen from drowning by turning itself into the island. 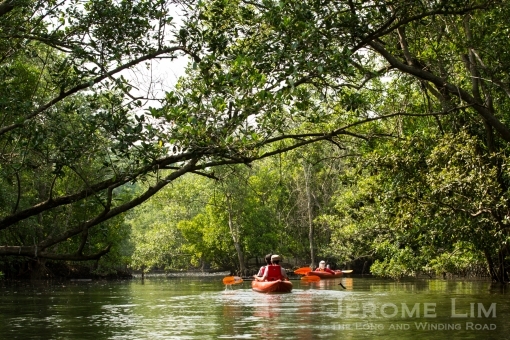 There are several more legends that provide an explanation for the origins of the pilgrimage, the keramat-keramat and the personalities that they are associated with – all of which are unverified (see: Kusu Island – on Infopedia). An old postcard showing Kusu Island before reclamation. 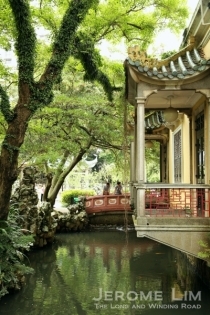 The Tua Pek Kong temple on the ‘head’ of the tortoise (source: The Aged In Singapore: Veneration Collides With The 20th Century, Nada Skerly Arnold, 1971). The head of the tortoise (photo: Steffen Röhner on Panoramio). The temple and the expanded island today. More on the pilgrimage in modern times: Keeping alive Kusu Island pilgrimage (The Straits Times, 9 Nov 2017). A street in Singapore that I have long been familiar with from my many encounters with it throughout my childhood and my days going to school in the area is Waterloo Street. Well-known back in the 1970s for the ‘sarabat stalls’ – a row of food stalls which was a destination for not just good teh sarabat (ginger tea), but also where some of the best Indian rojak in Singapore was to be found, Waterloo Street was also where many rather stately looking buildings could be found – particularly along the stretch that is directly opposite the former St. Joseph’s Institution (now the Singapore Art Museum) which I attended. 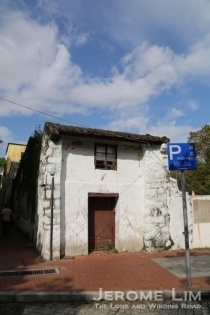 One which did stand out – was a white building with blue windows and a blue Star of David which we referred to as the synagogue, the Maghain Aboth Synagogue. Glass at the synagogue’s porch. The synagogue as seen from Waterloo Street today. 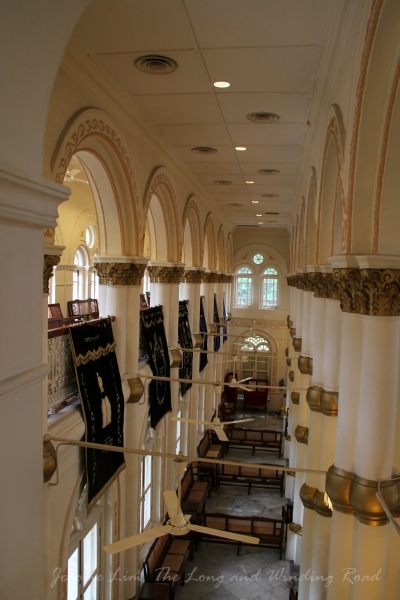 The synagogue was always a place that seemed mysterious to me, and one that has remained a mystery until very recently when I had an opportunity to see its insides through a Preservation of Monuments Board (PMB) Monument Open House walking tour. 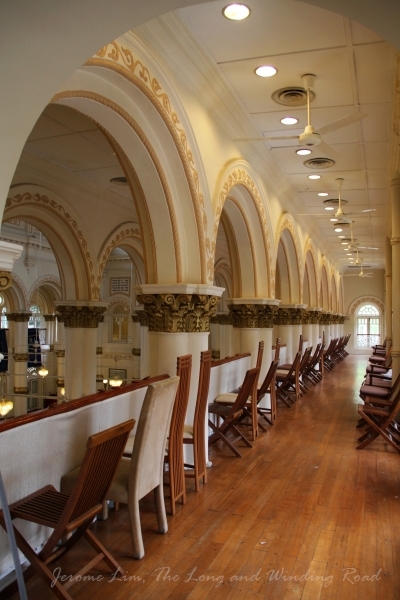 Maghain Aboth Synagogue, which translates as “Shield of our Fathers”, one of two Jewish houses of worship found in Singapore (the other being the Chesed-El), is the oldest existing synagogue not only in Singapore, but also in South-East Asia. 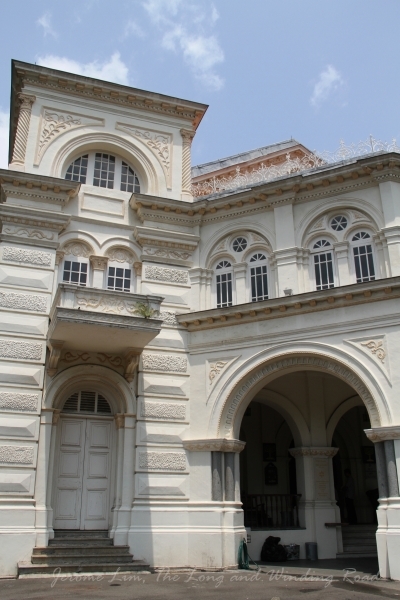 Gazetted as a National Monument in 1998, the synagogue provides a link not just to a small but historically significant ethno-religious community in Singapore, but also to the trade motivated diaspora of Baghdadi Jews which saw the arrival from India of the first members of the community in Singapore in the 1830s. Maghain Aboth Synagogue in 1982 (source: from the Lee Kip Lin Collection. All rights reserved. 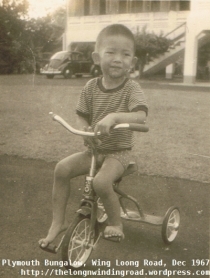 Lee Kip Lin and National Library Board, Singapore 2009). 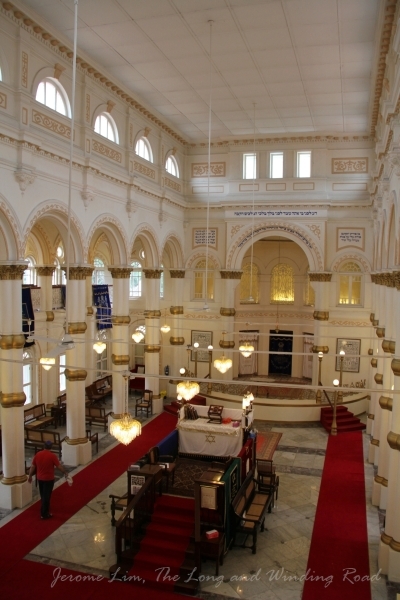 The synagogue from inside the compound. An aerial view of the Bras Basah area in the 1970s in which the Maghain Aboth Synagogue can be seen at the top (left) of the picture. 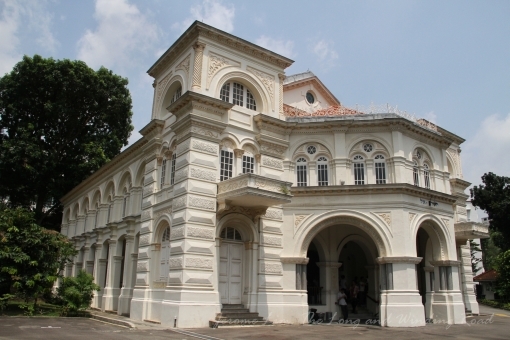 The Maghain Aboth wasn’t the first synagogue in Singapore. 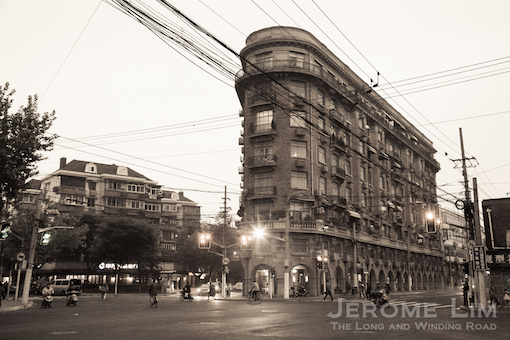 The first was one that was housed in a shophouse. Established in 1841, it was to give Synagogue Street its name and served the community until the 1870s. 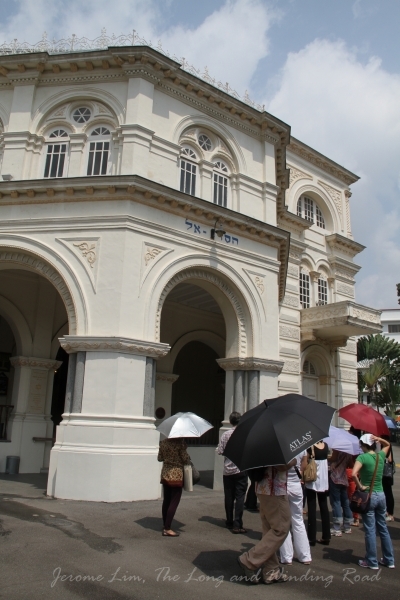 The limited to its capacity coupled with a fast growing Jewish population in Singapore required a larger building than the shophouse which house a congregation of forty. The land at Waterloo Street (which until 1858 had been known as Church Street) on which the present synagogue, the Maghain Aboth stands, was secured in the 1870s by Sir Manasseh Meyer (who later also built the Chesed-El as a private synagogue) and the Maghain Aboth was built. 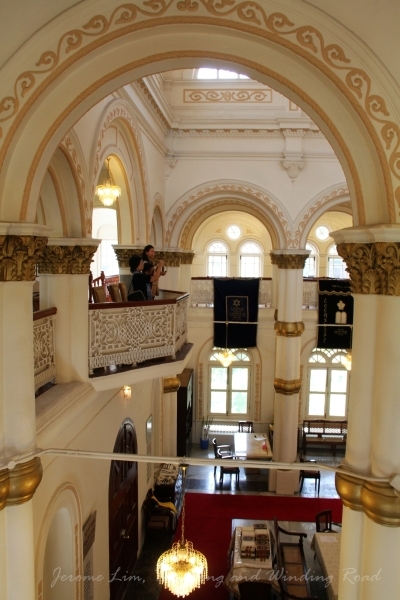 The synagogue designed in the neo-classical style was completed in 1878 with several extensions added over its 134 years, including a second level seating gallery to allow women to worship. It was close to the synagogue that a larger community of Baghdadi Jews began to settle around – giving rise to the Jewish quarter around the nearby Middle Road and Selegie Road area that came to be known as the Mahallah. 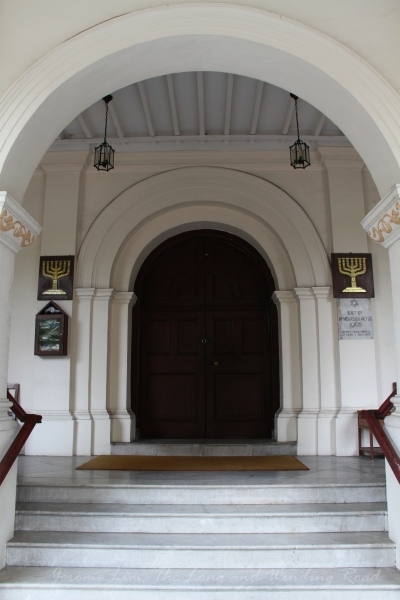 The entrance to the synagogue in the 1970s (source: National Archives of Singapore http://a2o.nas.sg/picas). A map of the Bras Basah area in the mid 1800s well before the Maghain Aboth was built. Waterloo Street had then been named Church Street. The layout of the synagogue is very similar to but is much less elaborated decorated than the Chesed-El. The centre of the hall which faces Jerusalem features a bimah, a raised wooden pulpit where the rabbi leads prayers and reads from Torah scrolls (Sefer Torah) during services. 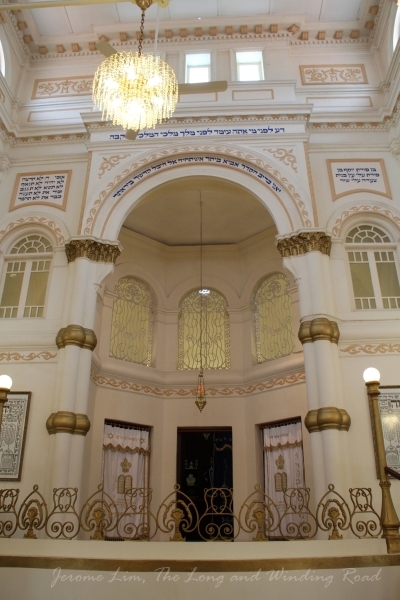 At the west end of the hall, the most sacred part of the synagogue, the the ahel or ark is arranged. The ark is where the Torah scrolls are kept, covered by a parochet or curtain. The prayer hall points west towards Jerusalem. 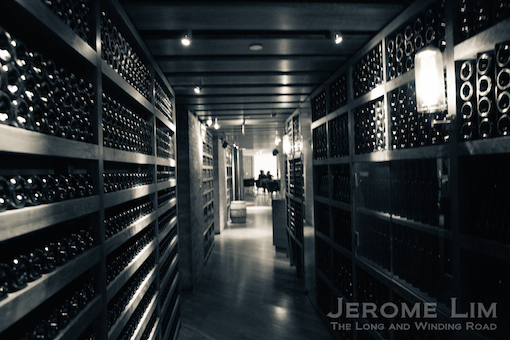 At the end of the hall is the ahel or ark. The pulpit or bimah is seen in the centre. The eastward view of the prayer hall from the west end. 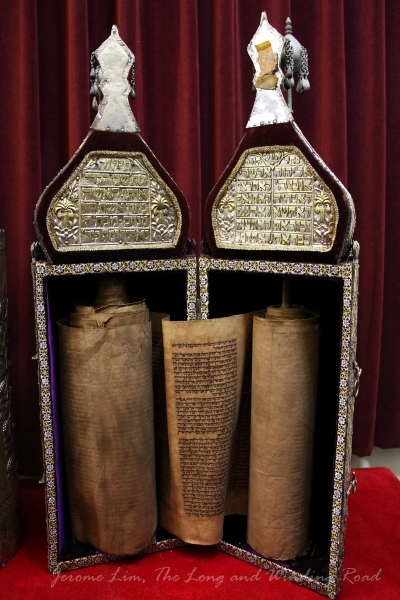 The ark or ahel behind the parochet or curtains is most sacred part of the synagogue and where the Torah scrolls are kept. The part of the bimah on which the rabbi leads the prayers. A more recent extension to the compound on which the synagogue stands is where the stained glass fronted Jacob Ballas Centre now towers over the Maghain Aboth. Built as a community centre, the Jacob Ballas Centre is named after a very successful stock broker, the late Jacob Ballas, who was a prominent member of the community. The centre houses function rooms, offices and accommodation for the rabbis, a kosher slaughter room for fresh chicken, a kosher restaurant as well as a kosher shop. 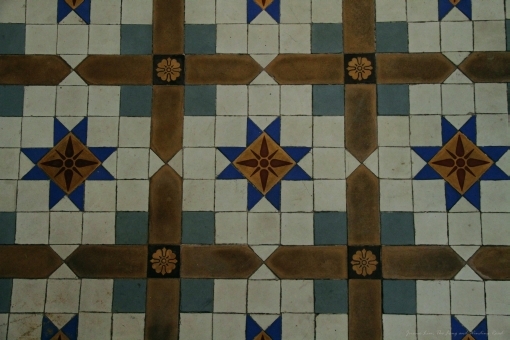 For more information on the Maghain Aboth and the Jacob Ballas Centre, do visit the links below. Stained glass at the Jacob Ballas Centre. 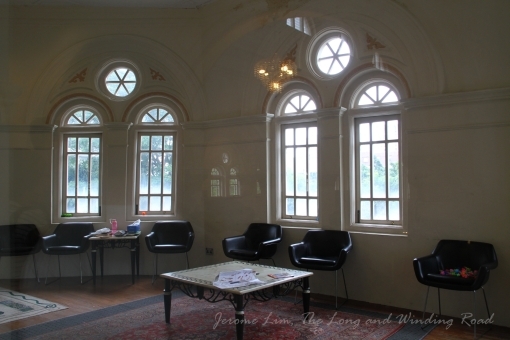 A reading room at the Jacob Ballas Centre. 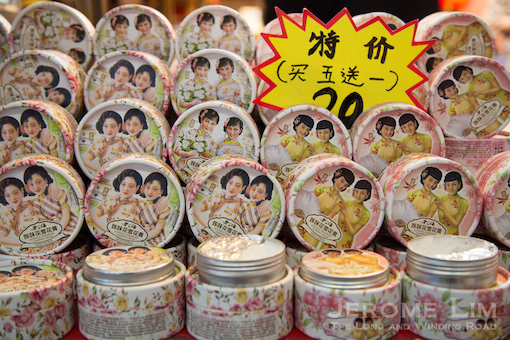 One of the wonderful things about Singapore is the diverse cultural and religious practices, some modified with time, some influenced by the environment, but many that remain distinct reflecting the many lands far and wide from which immigrants to Singapore have arrived from. Besides the myriad of festivals that seem to go on all year around, this diversity is also reflected in its architectural heritage – some 28 of its 64 National Monuments are places of worship which are very much in use today. 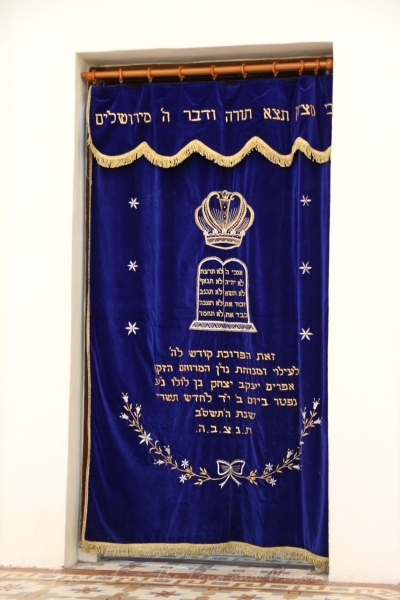 A page from religious diversity of Singapore – a Sefer Torah at the Chesed-El Synagogue. 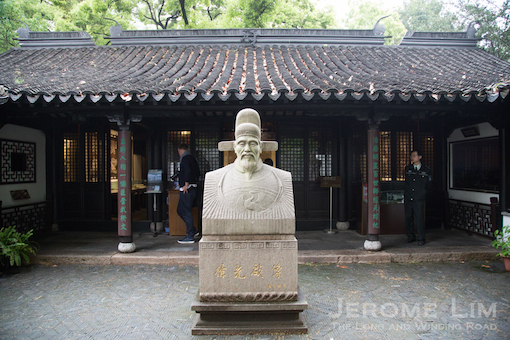 Two of the 64 that I had an opportunity to visit during a recent Preservation of Monuments Board (PMB) walking tour were the Hong San See Temple and the Chesed-El Synagogue. The Hong San See or Temple on Phoenix Hill is one that I already am familiar with from a previous visit. A magnificent and beautifully restored example of Fujian Lam Ann (Nan’an) religious architecture, its last restoration effort from 2007 to 2009 earned a UNESCO Asia-Pacific Heritage Award for Cultural Heritage Conservation in 2010. More information on the temple can be found in my previous post The Temple on Phoenix Hill. The Chesed-El Synagogue at Oxley Rise was one of two religious monuments I recently had an opportunity to see as part of a Monumental Walking Tour organised by the PMB. 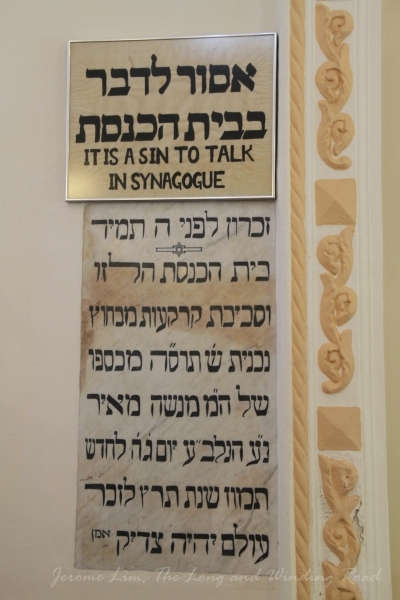 The main motivation for my participation in the tour was more for the opportunity it provided to visit a synagogue as I had never in stepped into one. While there are two such places of worship in Singapore, such opportunities are rare, especially due to more recent security concerns and this provided me with a look of what it was like behind the façade of a religious building belonging to a small and sometimes lesser known local community which has made a significant contribution to Singapore. 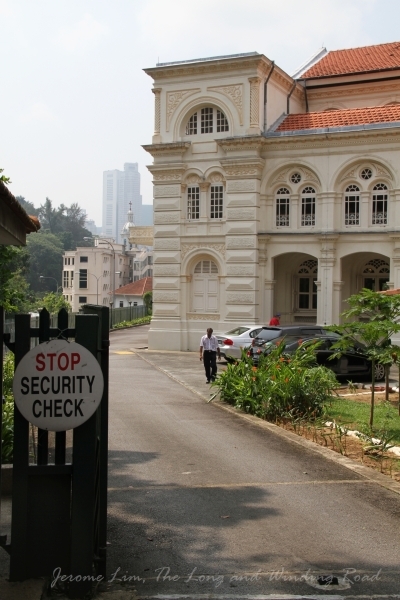 Opportunities to visit a synagogue are rare especially with more recent security concerns. A look beyond the Chesed-El’s façade. The wooden pulpit or bimah is seen in the centre of the hall with the ahel or ark at the end. 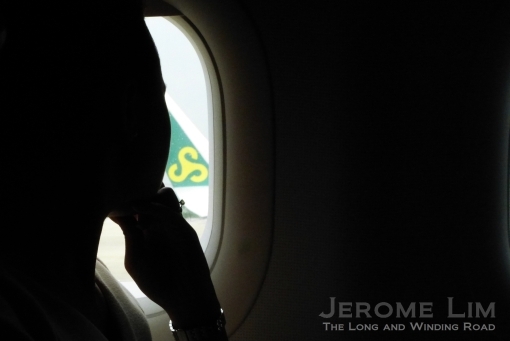 The Jews in Singapore have certainly made a huge contribution to its development with many notable names through Singapore’s history, members of the community. 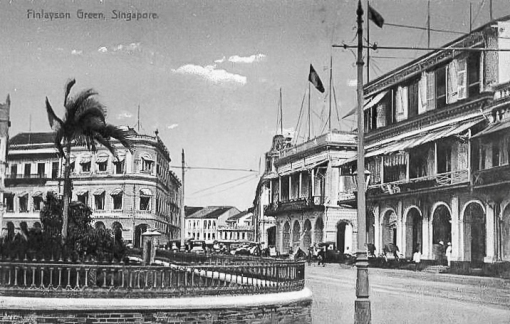 One of its prominent members in the early days of Singapore was a certain Sir Manasseh Meyer, a highly successful businessman and property owner, who counted among his properties, the Sea View Hotel and the Adelphi Hotel, lending his name to Meyer Road. 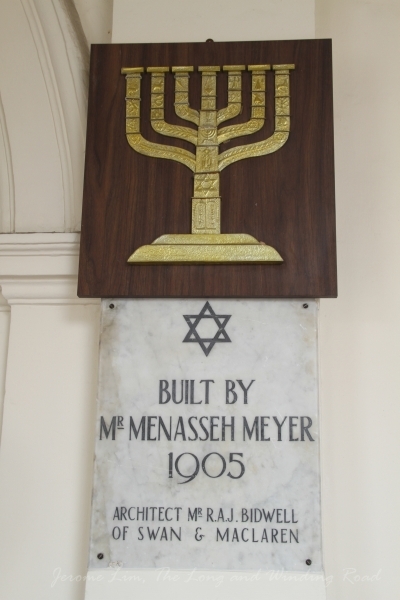 It was also Manasseh Meyer who built the Chesed-El, Singapore’s second synagogue (after Maghain Aboth in Waterloo Street). 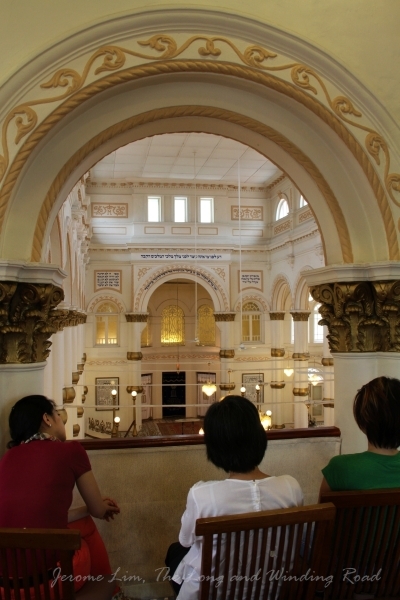 Participants on the walking tour had a chance to look at the second of two synagogues in Singapore. The Chesed-El completed in 1905 on Manasseh Meyer’s sprawling estate in Oxley Rise, Belle Vue, was designed by Regent Alfred John Bidwell of architectural frim Swan & Maclaren (which was responsible for many of the monumental works of architecture in Singapore) in the Palladian style. 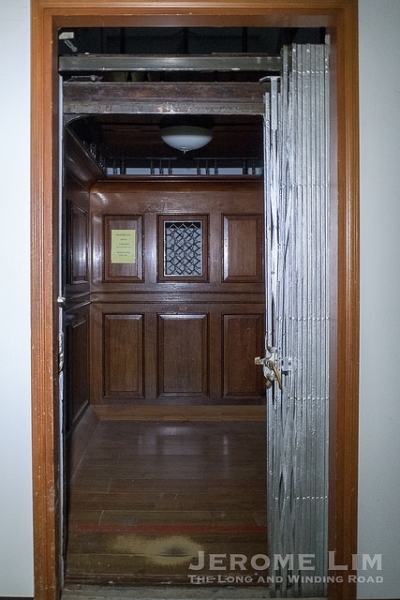 What had prompted Manasseh Meyer to build Chesed-El, which translates as the “bountiful mercy and goodness of God” were differences of opinions which members of the community from differing backgrounds had at the Maghain Aboth, which was built as a private synagogue. The synagogue was completed in 1905. 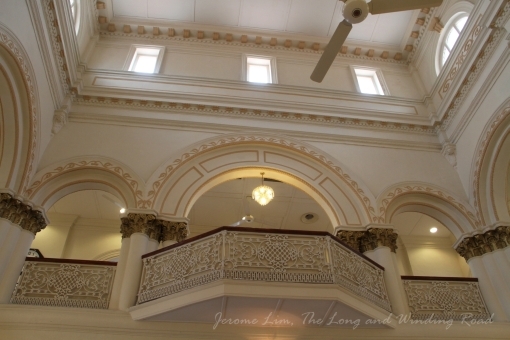 The building was built in the grand Palladian style. 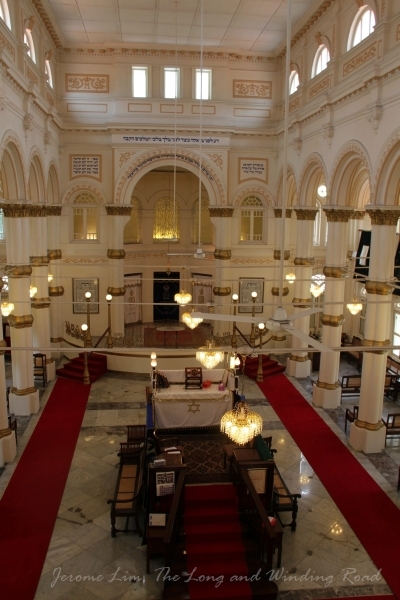 Besides providing the opportunity to have a look into the synagogue, the visit also allowed a better appreciation of the layout of a synagogue. Placed in a westward facing direction to Judaism’s eternal city, Jerusalem, a wooden pulpit rises at centre of the hall. The pulpit or bimah, is where prayers where the rabbi leads the prayers, and where the Torah scrolls (Sefer Torah) are placed and read during services. The entrance to the synagogue. 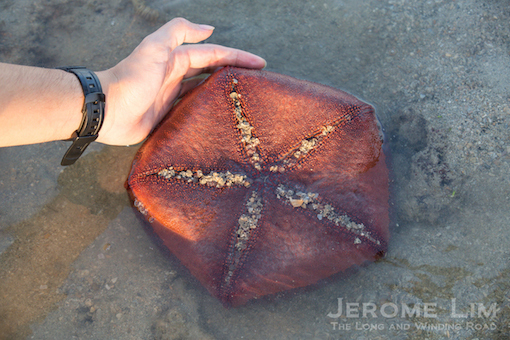 A closer look at the bimah. The entrance and the balconies on the upper gallery. The visit also allowed us a peek at the upper gallery where the women are kept separated from the men during services. 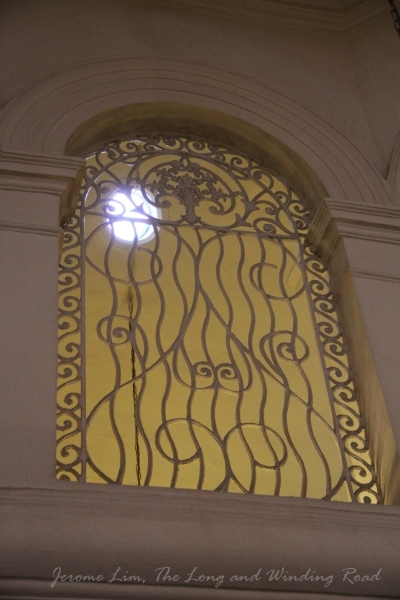 The balconies on the upper gallery feature iron work that we were told were imported from Scotland which provided an appreciation of the effort taken in the building of the house of worship for the greater glory of the Maker. The balconies on the upper gallery, reserved for women, feature beautifully crafted ironwork imported from Scotland. 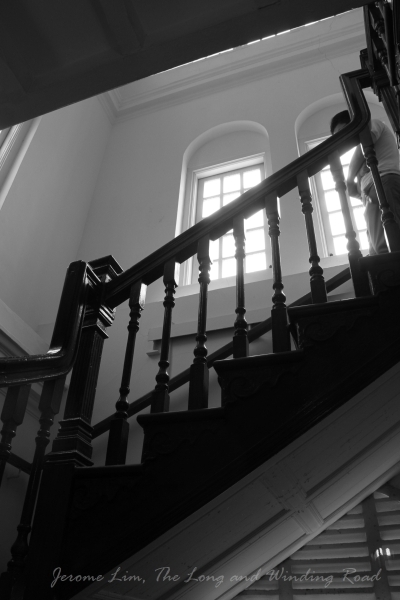 The staircase to the upper gallery. A view through an arch on the upper gallery. A quiet room on the upper gallery. Another view from the upper gallery. The highlight of the visit was a close-up look we had at Sefer Torah as well as a look into the holiest part of the synagogue, the ark or ahel – a room where the Sefer Torahs are stored. 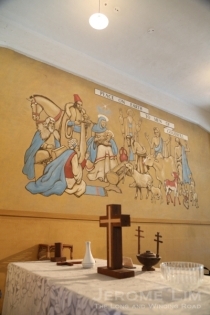 The sefers or scrolls are made from specially handwritten parchment and are ones donated by members of the congregation, and includes one that is a hundred years old. The ahel at the front end of the hall is behind three curtains. 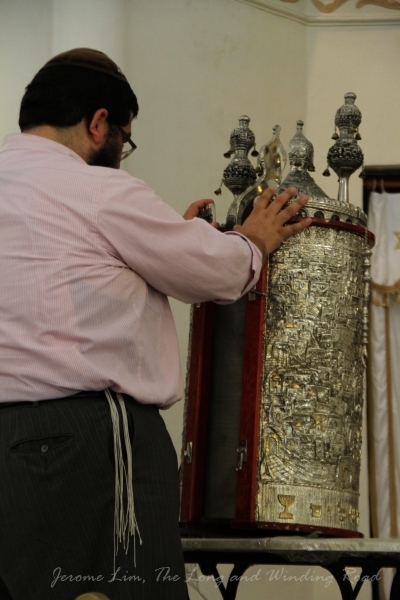 A rabbi opening a Sefer Torah. 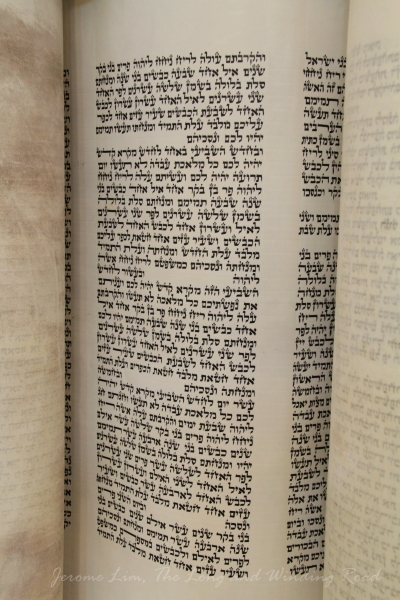 A hundred year old Sefer Torah in the ahel. The ahel’s entrances are covered by a curtain or parochet. 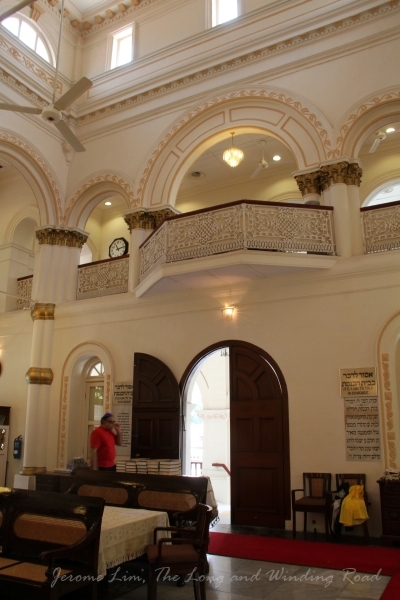 The look at the synagogue was one that provided not only an insight into the religious practices of a small but important community in Singapore, but also one which offered a window into the role the many successful immigrants who came from far and wide played in building and supporting their respective communities. It is these communities which have provided the foundation on which Singapore’s success is built and which makes Singapore that wonderful celebration of cultures and religions that it is today. 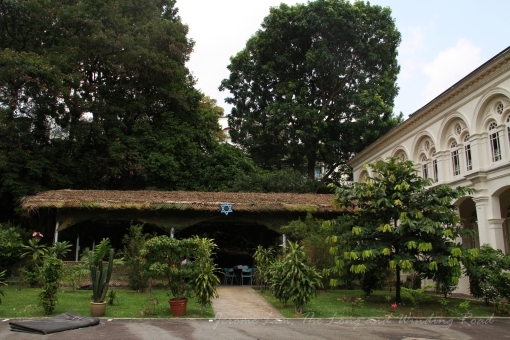 The grounds of the synagogue.